Wow, it’s been more than a month since our last museum visit; at this rate, we’ll be doing this until we are retired. Truth be told, we did go to another museum (the Putnam Cottage in Greenwich) on our way back from a trip to see family in Delaware, but it was mysteriously closed. This seems to happen a lot on CTMQ, so we’d better get used to it. I dragged wife and child along again, as a precursor to a our second section hike along the Metacomet Trail, just south down Route 71. I had to promise a 20 minute time limit on our visit – but that was before we saw how wondrous the Berlin Historical Society Museum is inside! What a gem. “You’re not supposed to, but ok,” said one of the ladies. 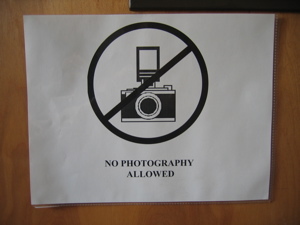 Curious as to why this little rarely-visited town museum would have such a rule, I asked them about it. “Because some guy a few years ago took a bunch of pictures which ended up in a book – uncredited to the museum.” That is similar to what we were told at the Butler-McCook House in Hartford as well. I assured them that CTMQ is not a commercial venture and they didn’t put up a stink. Many thanks go out to these lovely ladies and their understanding, hard work, and for the wealth of information given to me for this write up. Now only if I can remember any of it. 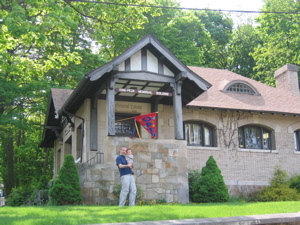 Before entering the museum from the ground floor, it would be good to note that the Peck Building was originally built as the town library in 1901. 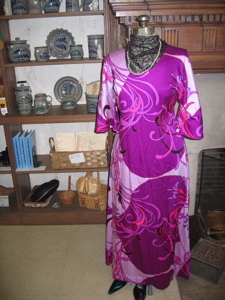 It remained in operation in that capacity until the late 1980’s when it was converted to the Historical Society. The original fireplace and turn-of-the-(last)-century oak paneling is still there. The stairwell up is adorned with a bunch of town and business signs from the past, and topped with a bunch of old maps and postcards. Past that, the rich history of Berlin was all around us. 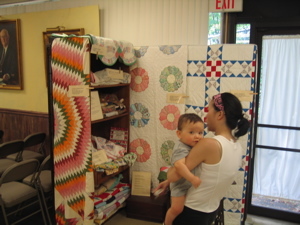 There was a hodge-podge area containing the old town jail door, an 1880’s sewing maching, some old handmade quilts, and a little display about “American Cookery” by Amelia Simmons. Why was that important? Because it just so happens to be the first American cookbook ever, published in 1796, that’s why. Yeah but, why was it here in Berlin? I don’t know, since it was published in Hartford and the life of Ms. Simmons had nothing to do with Berlin whatsoever. No matter, I found it pretty interesting. 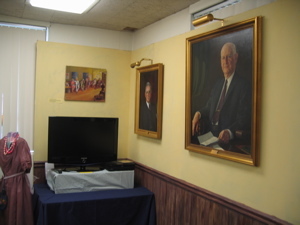 In the back corner we came upon a few portraits of past Berlin presidents and an incredibly nice Samsung flatscreen plasma television which was showing some videotape of Berlin history. At this point, Damian was getting antsy but we were barely half way done. 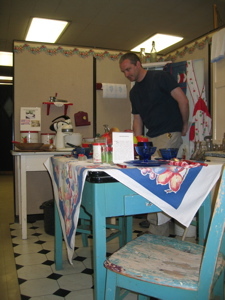 A 1930’s kitchen was set up which seems to be a theme in these random museums. 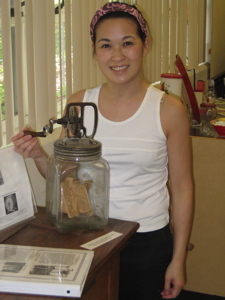 On the other side of the wall was an older colonial kitchen set up, which included a tiny little paddle butter churner that fascinated Hoang. We make homemade whipped cream all the time at home – with electric beaters. I think the cream becomes butter if one keeps whipping it. So to do this by hand, we imagined, would take forever. (The link below confirms this.) No thanks, that’s just crazy… But butter is oh-so delicious, so I’d have to think about it. No make-up, ready to hike, churning butter… and looking good. How does she do it? 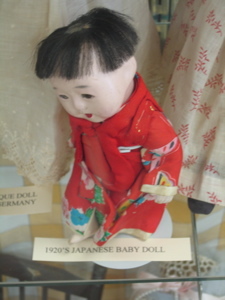 Behind the colonial kitchen display (where Damian ripped the “Do Not Touch” sign off the wall) was a display of old dolls and baby stuff from the past. That’s nice. 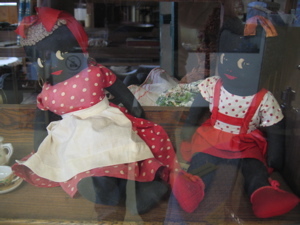 As we moved over to the other half of the museum we passed yet another display of racist mammy dolls! I am eager to find as many of these things as I can around the state – and I don’t know why. There were some stacks of old toys and children’s clothes that were found in someone’ s attic, as well as a rather eclectic selection of items for sale. Honey, candles, posters… We didn’t buy anything, but it’s nice to know where I can get a snowglobe with a little brick in it. There were some dressforms with old dresses from various points in the last century (of course), but there was also the large display of tin items – the industry that really put Berlin on the map. “We can’t really verify if any of this tin stuff was actually made here in Berlin,” said one of the curators. Hmm, okay, points for honesty. “We don’t even know if they are originals or replicas either.” Fine, I can live with that, so why do I care about tin in Berlin? Back in 1740, William and Edward Pattison arrived from Ireland. They brought with them a few sheets of tin, and began to make tin items. They soon began to peddle their wares from door to door. 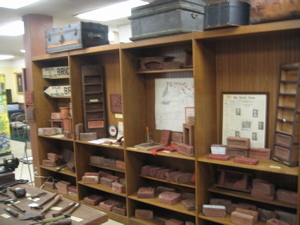 This was the start of the “Yankee Peddlar” and the beginning of tin manufacture in this country. That blurb was taken straight from a sign for elementary school visitors at the museum and it pretty much sums up what makes Berlin proud. The Yankee Peddlar is on the town seal and he is a rather important fellow in these parts. Not being from here, this didn’t mean much to me, but I have seen that term in a variety of places around the state. Regardless, he is a handsome fellow. There are a lot of tin items around the museum and Berlin is certainly proud of its deserving place in tin industry lore. It was a joy to hear the two curators recount stories and take pride in their town – and that’s what CTMQ is really about anyway. Who cares if none of the tin was from the 18th century? Not I, which was evidenced when I stopped talking tin and asked about something else in Berlin that interests me even more: The geographic center of the state. My family, the volunteer women, and lots of tin implements. What more could I ask for? And since I pass this spot twice, 5 days a week, on my way to and from work… Oh I’ll find it if it’s in there. Mark my words. 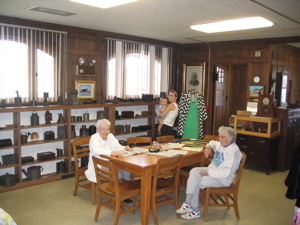 We talked of old timers at other old timey museums (they all know each other, it seems) and bid the ladies adieu. After all, we had a hike to hike and a one-year-old to deal with as well. But shouldn’t they call it, “Bertin? That’s me. In a kitchen circa 1935. Cooking. 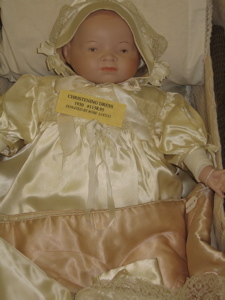 Apparently little babies got christened in Berlin back in the day too. A true-to-life Colonial kitchen. Smallpox and everything. Ahhh, a museum isn’t a museum until I see ’em! Children? Eh. Ok, but why? Look at all the Yankee Peddlars! Thanks for re-discovering Connecticut! 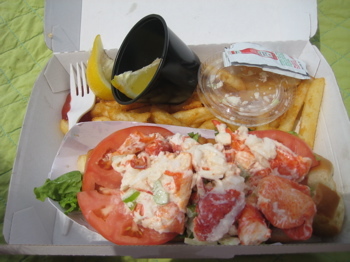 We are visiting there this summer and you will make our travel plans even easier. Thank you! I am currently a Buckeye and used to be a Nutmegger. I would like to find a list of the jewelers in Berlin, Germany prior and up to 1934. I would like to know where I might find a map listing the businesses at that time. I just stumbled across your site and review of the Berlin museum while doing some research (on, you guessed it, tin). As a member of the Berlin Historical Society, I gotta say…I love your little review :) It was great to see the place through the eyes of a non-native. 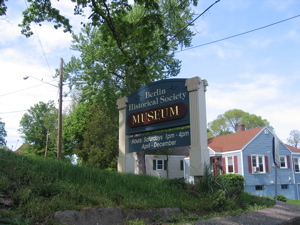 I am also a member of The Berlin Historical Society and your blog story about our cherished museum warmed by heart. 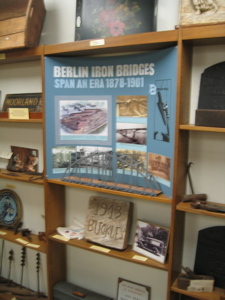 We knock ourselves out creating ever changing displays and educational programs, not only at the museum in the old Peck Library, but at the Berlin Fair (first weekend in October). 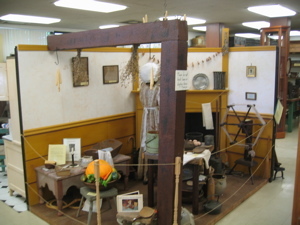 The most frequent comments we get from first time visitors are “Wow, we had no idea all this was here!” and “Your Historical Museum Barn is the best thing about the Berlin Fair.” Among the subjects of extensive displays we’ve constructed in recent years are The Leather Man, The Berlin Trolley, Berlin Cemeteries, Cider Mills, Dairies, Street Histories, Noted Berlin Artists, Vintage Wedding Gowns and The Yankee Pedlar. We also produce a different themed DVD each year using photos from our archives. Soon you will be able to check in on what we are doing through our website berlincthistorical.org. 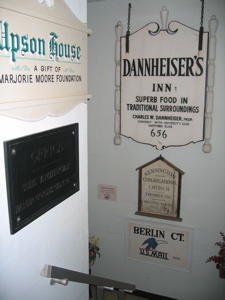 Hi – I’ve visited Berlin, CT for about 7 years and I’m curious about a a house located at Episcapal & Deming Road. It’s a large gothic sort of house/farm. It looks to be in ruin but is in habited. Any info you could send me would be greatly appreciated. I am trying to find out if you are having your Christmas Craft Show this year. I went last year and thought it was so much fun. Do you have a tentative date for this event yet?? what ever happened to the old selden school? I live in the old Selden School! 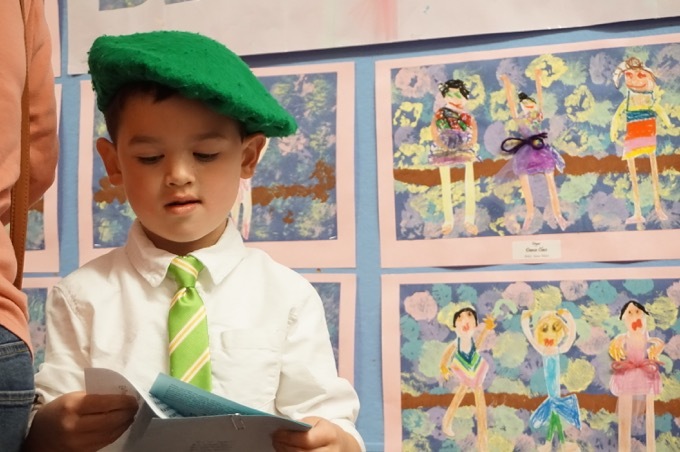 Have fond memories of my 3 years at Selden School-its last 3 as a school. Remember going to Selden School reunions in the 1950’s with my parents who attended it in early 1900’s. Also remember John Mcguigan and his brother well. 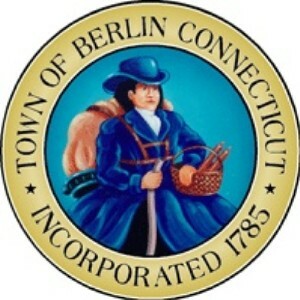 I have a Tin Smith’s Anvil that’s marked Berlin CT.